Marcos Coll was born Madrid (Spain) in 1976 but soon moved with his family to Santiago de Compostela, in the northwestern Spanish region of Galicia. 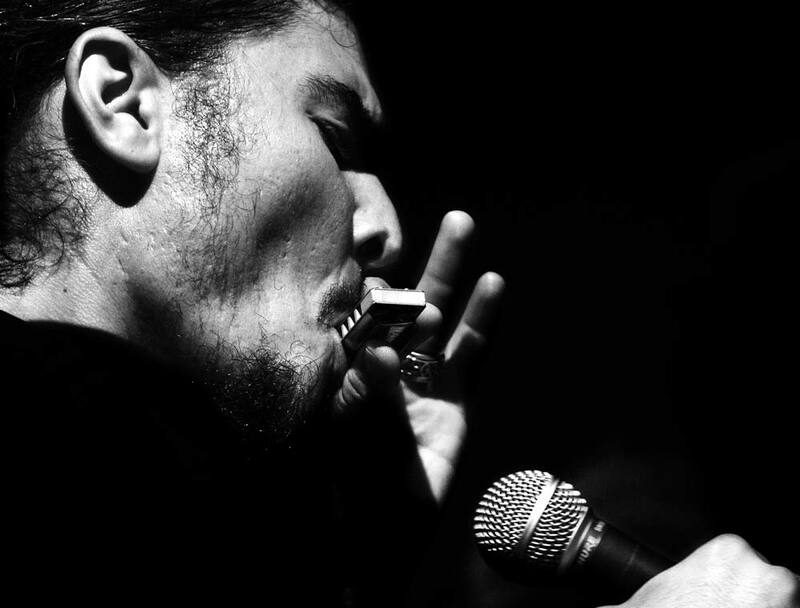 He started playing the harmonica at the age of 13, influenced by his musician uncle and by Spanish blues harp legend Ñaco Goñi. After playing with different amateur bands, such as the Red Bues Band, he formed his first professional band called Bluerags. In 1999 Coll moved back to Madrid to join the most famous Spanish blues band at that time, Tonky Blues Band. With this band, at the age of 21 he had the opportunity of touring and recording with rock and blues legends like Mick Taylor (Rolling Stones ) or Buddy Miles (Jimmy Hendrix Band of Gypsys) and even did a blues gig with Tom Jones(!). 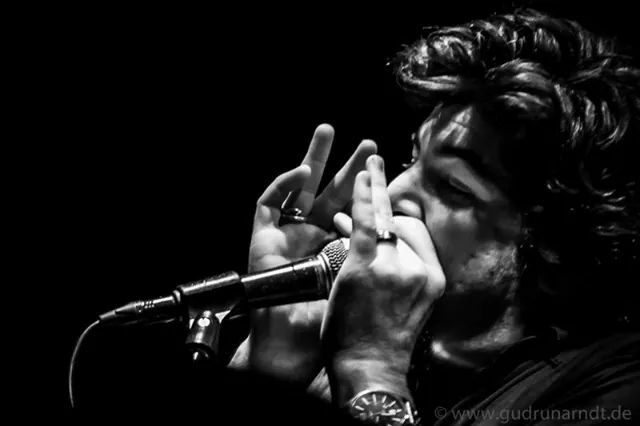 In 2004 Marcos Coll moved to Berlin, where through well-known German blues musicians like Chris Rannenberg and Micha Maass he soon became part of the blues scene in the German capital. As a studio musician he has recorded with nationally famous Spanish bands such as Siniestro Total, and has recorded music for TV and silent movies. While Coll is not prolific songwriter, some of his songs have been used in TV series and movies, such as Mexico’s blockbuster "Suave Patria,” or the song that is one of the anthems of the Spanish first division basketball team Obradoiro CAB, where the young Marcos Coll played on the junior team. 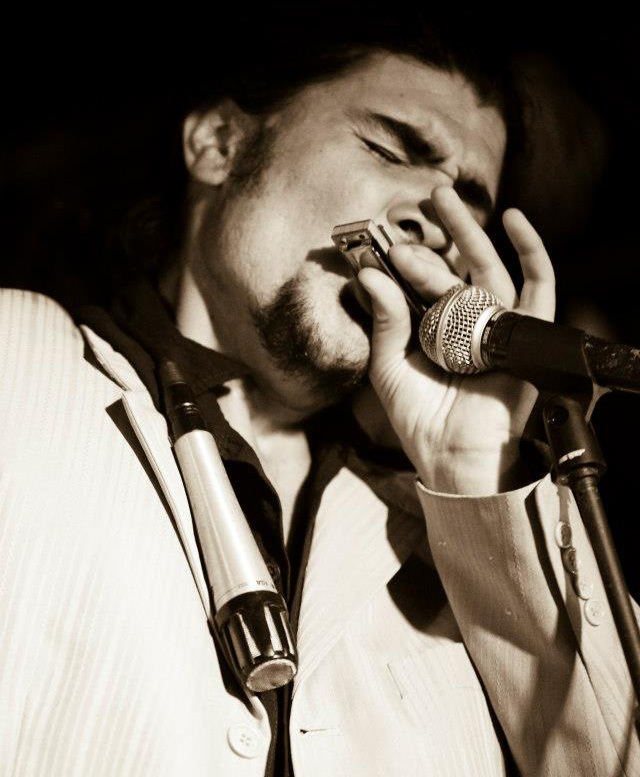 He has also worked as a harmonica teacher in music schools in Spain and today does workshops and gives master-classes all over the world in Spanish, English and German. 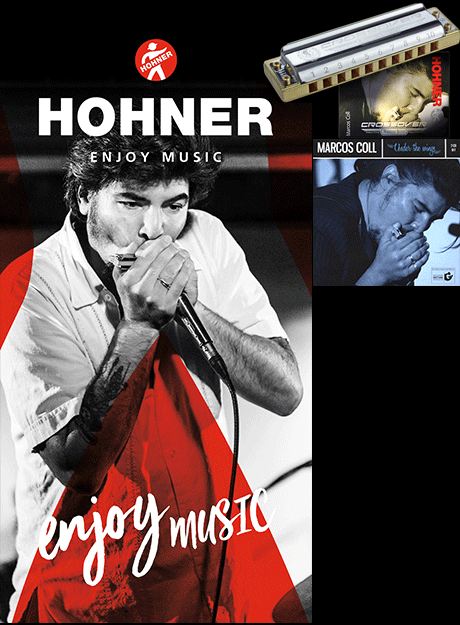 As an endorser of the world famous German musical instrument manufacturer Hohner, in 2009 and 2013 Coll performed, conducted a workshop, and was part of the jury at the most prestigious harmonica festival, the World Harmonica Festival, held every four years in Trossingen, Germany. Nowadays, besides performing as Marcos Coll Blues Jarana, he also works often with the legendary bluesman Guitar Crusher, as well as with his Mexican Latino music band Los Mighty Calacas, which has toured all over the world and has released a CD featuring such top guest musicians as Charlie Musselwhite. Besides the discography with Los Reyes del KO, Los Mighty Calacas and other collaborations, particular attention should be paid to Coll’s double album CD "Under the Wings,” a mixture of old classic blues and more modern funk, Latin and hip hop, which looks back over a 20-year career and includes recordings with such legends as Buddy Miles, Mick Taylor, Aaron Burton, etc. Coll has presented “Under the Wings” on his tours of Europe, America, Asia and Africa. Since September 2014 Coll has been hosting his weekly Monday Jelly Roll Session at Berlin’s famous White Trash Restaurant and Club. Also in 2014, and in collaboration with Ambar Multimedia, Coll launched a modern online harmonica course called Harp & Soul that quickly attracted students from around the world. In this 2016 along with the italian guitar player and singer Stefano Ronchi they published their new cd ¨Street Preachin" that mixes traditional Delta and traditional blues with modern beats like hip hop. Marcos Coll nace en Madrid en el 1976, trasladándose a Santiago D.C en la infancia. Con 13 años empieza a tocar la armónica gracias a su tío también músico, e influenciado por el legendario armonicista español Ñaco Goñi .... Después de formar varias bandas amateurs como Red Blues Band en el 95 forma su primera banda profesional llamada Blue Rags. En 1999 regresa a Madrid para pasar a formar parte de la banda de blues más antigua y conocida del país, la Tonky Blues Band. Con esta banda a los 21 años tuvo la oportunidad de girar y grabar con leyendas del blues y el rock como Mick Taylor (guitarrista de Rolling Stones) o Buddy Miles (baterista de Jimmy Hendrix Band of Gipsys) e incluso hizo un concierto de blues con Tom Jones!!! Después de todas esas experiencias y aprendizaje, junto con Adrian Costa decide formar Los Reyes del KO, que pronto se convirtió en una de las grandes referencias del blues en España y en Europa, ganando todo tipo de premios y reconocimientos y llegando incluso a aparecer en los libros de música de educación secundaria de Galicia. Con dicha banda comparten escenario por todo el mundo con grandes de la música como Buddy Guy, Chuck Berry, Johnny Winter, Robert Cray, John Mayall, Solomon Burke, The Animals o los Fabulous Thunderbirds. Marcos Coll wurde 1976 in Madrid (Spanien) geboren und zog bald darauf nach Santiago DC. Im Alter von 13 Jahren begann er Mundharmonika zu spielen, wobei ihn sowohl sein Onkel, als auch die spanische Bluesharp-Legende Ñaco Goñi stark beeinflussten. Nachdem er mit verschiedenen Amateurbands, wie die Red Bues Band spielte, gründetet er seine erste professionelle Band, die Bluerags hieß. 1999 zog er zurück nach Madrid, um der damals erfolgreichsten spanischen Bluesband “Tonky Blues Band” beizutreten. Mit dieser Band hatte er, im Alter von 21 Jahren, die grandiose Möglichkeit mit Blues- und Rocklegenden wie Mick Taylor (Rolling Stones ) und Buddy Miles(Jimmy Hendrix Band of gipsys) zu touren und aufzunehmen. Dabei hatte er sogar einen beeindruckenden Auftritt mit Tom Jones !!! Nach all diesen Jahren wichtiger Erfahrungen, gründete er mit seinem besten Freund und sagenhaften Gitarrenspieler sowie Sänger Adrian Costa seine eigene Band namens 'Los Reyes del Ko', die bald eine Top- Bluesband in Spanien und Europa wurde, verschiedene Preise gewann und Nominierungen erfuhr. 2004 zog er nach Berlin und die Band gewann weitere Awards und Ansehen. Sogar in den galizischen Musikschulbüchern erschien eine ganze Seite über die Band. Weiterhin teilte er sich die Bühne mit Weltgrößen wie Buddy Guy, Chuck Berry, John Mayall, Johnny Winter, Solomon Burke, Robert Cray, the Animals, or the Fabulous Thunderbirds. 2004 zog Marcos nach Berlin und wurde durch bekannte deutsche Bluesmusiker wie Chris Rannenberg oder Micha Maass alsbald in die Bluesszene eingeführt. Als Studiomusiker nahm er mit berühmten spanischen Bands wie Siniestro Total u.v.m. auf. Ebenso machte er Musik für das Fernsehen oder vertonte Stummfilme. Obwohl er kein ständiger Komponist ist, fanden einige seiner Songs bereits Einzug in Fernsehserien oder Filmen wie der Blockbuster in Mexico "Suave Patria" und eine der Team-Hymnen des spanischen Basketballvereins Obradoiro CAB des ACB der spanischen Liga. In dem Team spielte er damals in der Jugendmannschaft selber. Einige Jahre unterrichtete er als Mundharmonikalehrer in Spaniens Musikschulen und auch heute gibt er weltweit Workshops und „Masterclasses“ auf spanisch, englisch und deutsch. Als Endorser für die bekannte Musikinstrumentenfirma Hohner, performte er 2009 und 2013 auf dem alle vier Jahre stattfindenden World Harmonica Festival in Trossingen, Deutschland.Neben den Bandauftritten auf dem weltweit wichtigsten Mundharmonika- Festival, gab er Workshops und saß als Juror im Ausschuss für die Nominierungen. Heute, neben dem Spielen in der Marcos Coll Blues Jarana, arbeitet er häufig mit dem legendären Guitar Crusher zusammen, sowie mit seiner mexikanischen latino Band Los Mighty Calacas, welche eine Debüt-Cd herausgebracht hat, die u.a. Charlie Musselwhite als Gastmusiker beinhaltet und mit welcher er in der ganzen Welt tourt. Neben der Diskografie mit Los Reyes del Ko, Los Mighty Calacas und weiteren Kollaborationen, sollte besonders sein Doppelalbum Marcos Coll "Under the wings" hervorgehoben werden, ein Mix aus altem klassischen Blues mit modernem Funk, lateinamerikanischer Musik oder HipHop. Die Doppel-Cd spiegelt seine 20jährige Karriere wieder und beinhaltet Aufnahmen der Legenden Buddy Miles, Mick Taylor, Aron Burton und vielen mehr. Er bereiste mit diesem Album viele Länder in Europa, Asien, Amerika und Afrika. 2014 brachte Marcos mit Ambar Multimedia den modernen online Mundharmonika Kurs Harp & Soul heraus, mit dem bereits Studenten aus der ganzen Welt lernen. Seit September 2014 leitet er die wöchentliche Monday Jelly Roll Session im berühmten White Trash Berlin. 2016 veröffentlichte er zusammen mit dem italienischen Gitarrist und Sänger Stefano Ronchi ihre neue CD "Street Preachin“. Ein Mix aus traditionellem Delta und traditionellem Blues mit modernen Beats wie Hip Hop. Harp & Soul "Learn the Secrets of the Harmonica"